Jeremy G. Hardjono has been praised by The Columbus Dispatch as an “outstanding young soloist” for his performance of “Adonai Roi” in Bernstein’s Chichester Psalms. Despite his young age, Jeremy has had considerable stage experience. While touring with the American Boychoir, he performed with the Philadelphia Symphony Orchestra in St. Matthew’s Passion and Bernstein’s Mass under the direction of Maestro Yannick Nézet-Séguin. He was a touring soloist for “Dicite in Gentibus” with the American Boychoir, a soloist for the CSO’s Holiday Pops under the direction of Mr. Ronald Jenkins and most recently a featured artist in the Mendelssohn’s Elijah under the direction of Maestro Rossen Milanov. Jeremy balances his love of classical music with his love of musical theater. He played the role of Chip Potts in the Olentangy Orange High School production of The Beauty and The Beast, and the role of an angel in the Princeton University Theater’s Tobias and The Angel. In 2015, he played the role of Amahl in Amahl and the Night Visitors at Denison University and with Opera Project Columbus under the direction of Maestro Alessandro Siciliani. Jeremy recently took part in La Boheme with Opera Columbus, and will be performing as Jean Prouvaire in the upcoming production of Les Miserables with Olentangy Orange High School this month. Jeremy began his musical training at a very young age with his mother in Kindermusik classes and went on to study piano when he was five years old. He started playing saxophone at ten, and sang in the Liberty Tree Elementary Choir. The choir has won several awards under the direction of Ms. Lori Walls. Jeremy has studied voice with Ms. Nancy Bos since 2014 and sings in the New World Singers and the Una Voce Choir of Columbus Children’s Choir under Artistic Director, Jeanne Wohlgamuth. In 2014, he was recruited by the American Boychoir of Princeton, New Jersey and attended the American Boychoir School from 2014 to 2015. He was promoted to the touring concert choir after only two months and participated in multiple national tours. 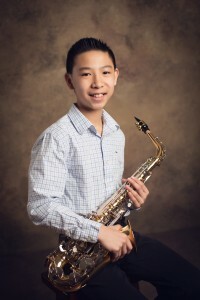 While not busy singing, Jeremy enjoys spending time with his family and friends, playing his saxophone or piano, reading, travelling, cooking with his mom and discussing technology with his dad. He would like to give thanks and glory to God who has given him the voice to sing, outstanding teachers and mentors to guide him, loving parents to drive him around, adorable siblings to make him laugh, and wonderful friends and relatives to support him.